Making it through our present-day technology transition is surely challenging. We live and work with one foot in the brave new digital, mobile and touch world while the other foot is in ye olde analog, wired and paper world. Have you done any of the following lately? Talk or text on your smartphone while letting your landline home phone ring without picking it up. 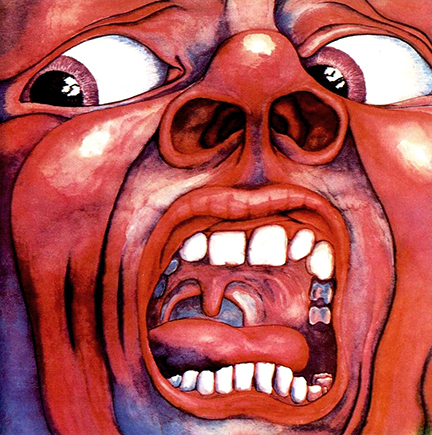 Purchase and download an album only to realize later that you already own the CD. Open every piece of US mail while ignoring or deleting the email cluttering your inbox. Check your Facebook newsfeed constantly while not having time to read or even open the daily newspaper. When looking back through history, however, it becomes clear that our present condition is not entirely unique. Previous generations have experienced disruptive and even devastating change. It is a fact that every age is both cause and effect; a moment in time between past and future with a host of unpredictable retreats, twists and turns. Some may ask: isn’t the present different because the pace of change is becoming quicker? This is true but, in relative terms, the rate of change has always been logarithmic from one generation to the next. The phenomenon of accelerated development embodied in Moore’s Law (the number of transistors on an integrated circuit doubles every two years) is frequently applied to all past and present technological progress. In reviewing the life of Frederic Goudy—the most important American type designer in the first half of the twentieth century—we see a man who thrived during an era of terrific change. 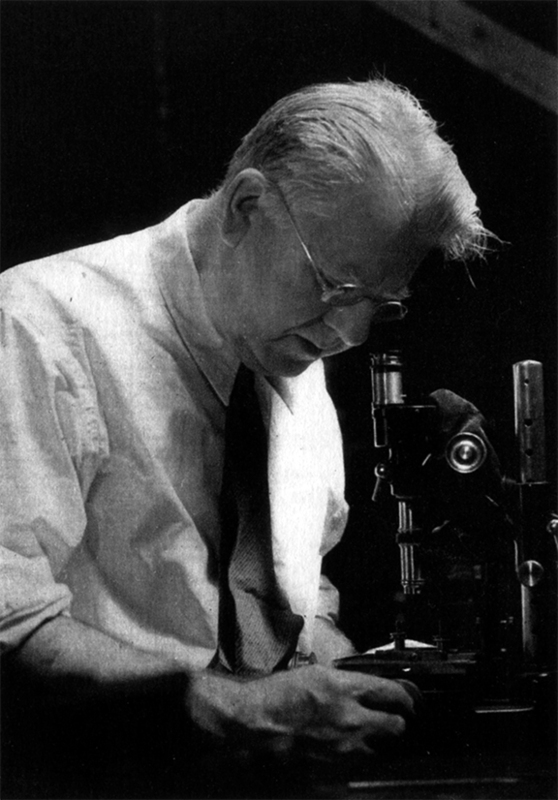 Born at the conclusion of the Civil War, Goudy lived through the industrialization of society and two World Wars. Without a formal education, self-taught and often under difficult circumstances, Goudy became a prolific type designer who was known the world over for his accomplishments. Significantly, Frederic Goudy drew his first alphabet at age 30 and began his career as a professional type designer at the age of 46. Frederic William Goudy was born on March 8, 1865 about 125 miles south of Chicago in a town called Bloomington, Illinois. As a youngster Fred spent time in the Bloomington library reading Mark Twain and browsing the illustrated Harper’s Weekly magazine. He developed the ability to trace and replicate wood engravings in pencil. Although, he did not excel at mathematics, Fred gained an interest in machines such as the lathe and the pantograph. Fred’s father, John Goudy, was a school administrator and later a real estate man. He moved the family to four different towns in Illinois in the 1870s and early 1880s. In 1883, the family relocated to the Dakota Territory where John started a business in connection with homestead claims. Living in the prairie hamlet of Highmore near an Indian Reservation and with just two years of high school education behind him, Fred went to work as a clerk in his father’s real estate company. In 1889, Frederic left Highmore and set out on his own. First going to Minneapolis and then Springfield, Illinois, he worked as a bookkeeper in the real estate offices. During these years, Fred gained experience with advertising and layout of newspaper ads. At twenty-eight years old, Fred moved to Chicago and worked for various offices writing advertising copy and designing ads with local printers. In the 1890s, there was no such thing as an advertising industry and there were very few advertising agencies. Newspapers and magazines were filled with garish promotional ads with very bad typography and florid graphics. At this time, Fred started swimming against the tide of generally murky and unreadable printing. In 1893, he founded a magazine called “Modern Advertising” as a means of generating business. 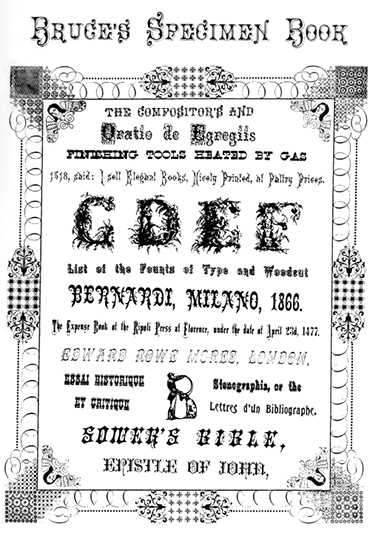 Although the publication did not last, Fred gained important experience with the type production and printing processes. 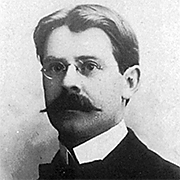 The young Frederick Goudy in the late 1800s. As an amateur, Goudy began experimenting with type designs and developed his hand lettering skills. After a short time in Detroit working for a weekly called The Michigan Farmer, Goudy returned to Chicago and worked on advertising for Marshall Field, The Inland Printer, The Pabst Brewery and Hart Schaffner and Marx. He also designed book covers for The Lakeside Press and Rand-McNally. All Goudy’s type designs through this period were for advertising purposes. By the turn of the century, Goudy wanted to follow Morris’ lead and print the finest books in America. To do so he believed needed to design his own typeface. 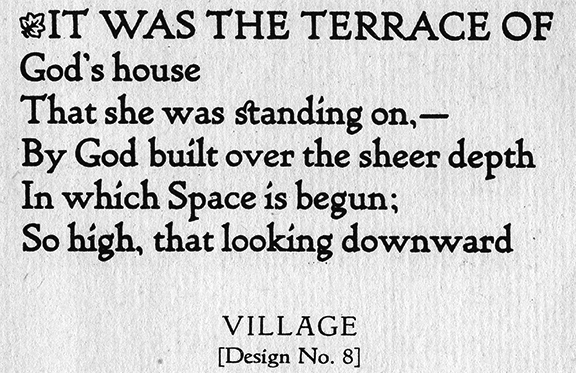 In 1903, Frederic Goudy made printing history with the establishment of The Village Press in Park Ridge, Illinois and the creation of The Village Type, his first fine book face. The Village Type was the very first American typeface to be cut and caste from free hand, original drawings from a type designer. In 1904, Frederic and his wife Bertha moved The Village Press to Hingham, Massachusetts to become part of The Hingham Society of Arts and Crafts and be surrounded by other craftsmen. In 1906, the Goudy’s moved their printing business to New York City. It was during a trip to England in 1909 and then a trip to the Continent in 1910 that Goudy focused himself upon the scholarship and history of typography. In 1911, according to his own account, Frederic Goudy became a professional type designer with the creation of Kennerley Old Style. Named for his business associate, publisher and Englishman Mitchell Kennerley, Goudy designed the font specifically for the publication of H.G. 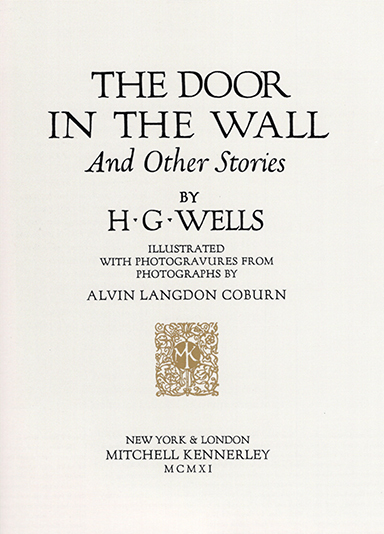 Wells’ “The Door in the Wall and Other Stories.” Kennerley Old Style was hit in England and through it Goudy suddenly became associated internationally with great type design. It would take some years more for his work to become recognized in America. A significant technology factor in the emergence of type design as a profession—making it possible for someone like Frederic Goudy to achieve success—was the invention by Linn Boyd Benton in 1884 of the pantographic engraver. This device, which represented the industrialization of metal type production, enabled foundries to cut matrices from enlarged drawings. Prior to this development, the making of type was largely the work of handicraft punch cutters and not that of designers. At the age of 60, Goudy acquired his own matrix-cutting machine on which he engraved and cast perhaps some of his greatest work. During his career, Goudy wrote extensively on type design, lettering, typographic style and history. His works “The Alphabet” (1918) and “The Elements of Lettering” (1922) remain important resources, that latter containing explanatory notes on the considerations and influences behind some of his typeface designs. He founded the journal “Ars Typographica” in 1918 and he became the art director for Lanston Monotype Corporation in 1920 where he remained until his death. I AM TYPE! Of my earliest ancestry neither history nor relics remain. The wedge-shaped symbols impressed in plastic clay by Babylonian builders in the dim past foreshadowed me: from them, on through the hieroglyphs of the ancient Egyptians, down to the beautiful manuscript letters of the mediaeval scribes, I was in the making. With the golden vision of the ingenious Gutenberg, who first applied the principle of casting me in metal, the profound art of printing with movable types was born. Cold, rigid and implacable I may be, yet the first impress of my face brought the Divine Word to countless thousands. I bring into the light of day the precious stores of knowledge and wisdom long hidden in the grave of ignorance. I coin for you the enchanting tale, the philosopher’s moralizing and the poet’s fantasies; I enable you to exchange the irksome hours that come, at times, to everyone, for sweet and happy hours with books—golden urns filled with all the manna of the past. In books, I present to you a portion of the eternal mind caught in its progress through the world, stamped in an instant and preserved for eternity. Through me, Socrates and Plato, Chaucer and Bards become your faithful friends who ever surround you and minister to you. I am the leaden army that conquers the world; I am Type! 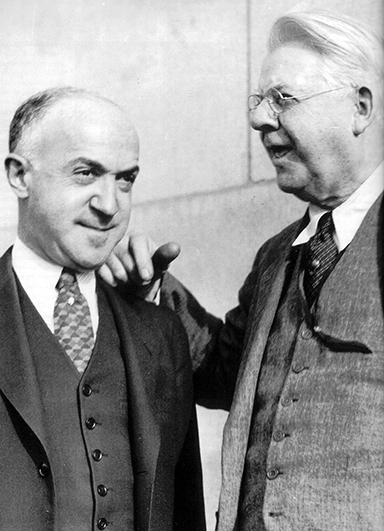 Frederic W. Goudy died at his home in Marlboro-on-Hudson, New York on May 11, 1947. He is buried next to his wife Bertha in Evergreen Cemetery in Chicago.